To Cite: Mansourian Hosseini S, Aliashrafi S, Ebrahimi-Mameghani M. The Effect of a Single Intramuscular Injection of Cholecalciferol on the Serum Levels of Vitamin D, Adiponectin, Insulin Resistance, and Liver Function in Women with Non-Alcoholic Fatty Liver Disease (NAFLD): A Randomized, Controlled Clinical Trial, Iran Red Crescent Med J. 2018 ; 20(10):e60746. doi: 10.5812/ircmj.60746. Background: Due to the fact that there is evidence indicating the role of Vitamin D in non-alcoholic fatty liver disease (NAFLD) as well as insulin resistance (IR) and adipokines production, studies examining Vitamin D on the metabolic factors involving NAFLD is required. Objectives: Therefore, we aimed to investigate the effect of single intramuscular injection of cholecalciferol on serum levels of Vitamin D, biochemical factors, and liver function status of women with NAFLD. Methods: This randomized controlled clinical trial was conducted on 82 NAFLD patients with Vitamin D deficiency (< 30 ng/mL), who were selected through convenience sampling from October 2015 to March 2016 in Tabriz, Iran, and were randomly assigned into an intervention (a single intramuscular injection of 600,000 IU of cholecalciferol) or control group. Before and after the study, serum glucose, insulin, 25-hydroxy Vitamin D, adiponectin, liver enzymes, calcium, phosphors and parathyroid hormone (PTH), as well as homeostasis model assessment (HOMA-IR), body composition, dietary intake, and physical activity level were assessed. Results: After one month intervention, serum 25-hydroxyvitamin D significantly increased in the intervention group vs. the control (24.9 ± 17.4 vs. 9.1 ± 5.6, P = 0.003). Total body fat (TF) decreased in the intervention group (P = 0.001) while visceral fat (VF) was significantly different between the groups (P < 0.001). Adiponectin, calcium, phosphors, and PTH levels increased, while liver enzymes, insulin, and HOMA-IR decreased in both groups (P < 0.05). There were significant differences in mean changes of serum 25(OH) D, PTH, ALT, AST, ALP, and FBS between the groups after adjusting for baseline, TF and VF. Vitamin D injection did improve NAFLD severity (P = 0.01). Conclusions: Cholecalciferol injection improved Vitamin D status and hepatic steatosis. Vitamin D is a fat soluble vitamin that regulates calcium and phosphorus metabolism and its main metabolite- 25-hydroxy Vitamin D (25(OH)D)- is produced by the hydroxylation of cholecalciferol in the liver (1). Vitamin D deficiency (25(OH)D < 20 ng/mL) is the most prevalent pathological condition in the world i.e. about 30% - 50% in different populations (2, 3). Besides its known role in bone health, reduced circulating 25 (OH) D has been related to various diseases, such as reduced insulin sensitivity, metabolic syndrome, and increased risk of type 2 diabetes (1). Vitamin D exerts its diverse biological effects in target tissues by regulating gene expression, which regulates many factors in the cell (4). Vitamin D receptor (VDR) gene expression in various tissues including liver, adipocytes, and pancreatic beta cells, represents important physiological roles of Vitamin D (5, 6). Since insulin resistance (IR) is involved in the pathogenesis of non-alcoholic fatty liver disease (NAFLD), a spectrum of liver disorders characterized by the hepatic accumulation of fat in subjects with no history of alcohol abuse, through its contribution in fat metabolism. Therefore, it seems that Vitamin D plays a role in the pathogenesis of NAFLD by influencing IR (7, 8). Recent cross-sectional studies have shown an association between Vitamin D deficiency and NAFLD (5, 7). Indeed, results of some case-control studies revealed that the serum 25(OH)D levels were lower in patients with NAFLD than healthy subjects (8, 9). In vitro studies have shown that Vitamin D regulates adiponectin gene expression in adipose tissue (10). Adiponectin, a key adipokine in metabolic syndrome and obesity related liver disease, appears to be as one of the possible mechanisms to explain the effect of Vitamin D on IR (11). Adiponectin is reported to be inversely associated with IR and metabolic syndrome (12, 13). It has been suggested that high levels of adiponectin may reduce liver steatosis, inflammation, necrosis, and IR in the animal model (14). Previous studies showed that Vitamin D supplementation improves serum insulin, adiponectin, and HOMA-IR (15-17). Confirmed evidence of an association between Vitamin D and adiponectin and their effects on IR and other metabolic indicators as well as low levels of adiponectin in patients with NAFLD provide a basis for designing clinical trials. However, the interventional studies regarding the effect of Vitamin D supplementation on metabolic factors in NAFLD is low and their results are in controversy. Therefore, the present study aimed to examine the effect of single intramuscular injection of 600,000 IU of cholecalciferol on serum levels of Vitamin D, adiponectin, insulin resistance, and liver function status of women with NAFLD in a randomized controlled clinical trial. This study was a randomized controlled clinical trial conducted on 82 women between the ages of 18 - 50 years and body mass index (BMI) between 25 - 40 kg/m2 with NAFLD confirmed by single ultrasonographist. The subjects were recruited from the outpatient clinic of Tabriz University of Medical Sciences, Tabriz, Iran from October 2015 to March 2016. Patients were included only if they have Vitamin D insufficiency (serum 25(OH)D < 30 ng/mL) and do not take dietary supplements including Calcium and Vitamin D over the last six months. The exclusion criteria included individuals free from diseases such as renal, hepatic, other endocrine disorders, and malignancies as well as pregnancy and lactation, alcohol consumption, and menopause condition or receiving medications influencing Vitamin D metabolism or insulin. The study protocol was approved by the Ethics Committee of Tabriz University of Medical Sciences (Registration number: TBZMED.REC.1394.63). This study was registered in the Iranian Registry of Clinical Trials with code number of IRCT201503163320N10. After the complete description of the study protocol and objectives, all participants signed a written informed consent. The patients were randomly assigned to the “Intervention” or “Control” group (N = 41 in each group) in the random blocks of four subjects using a computer Random Allocation Software, version 1, with stratification by age. A one-page questionnaire was fulfilled regarding demographic characteristics and sunlight exposure. There was a primary outcome: changes in serum 25(OH)D, serum adiponectin, HOMA-IR, liver enzymes, and change in grade of NAFLD. Secondary outcome measures included change in anthropometric variables. All Patients received pearl of Vitamin E 400 IU/day for one month as routine treatment for NAFLD (18). Those in the intervention group received a single intramuscular injection of 600,000 IU of cholecalciferol (two ampoules of the 300000 IU/mL, Osveh pharmaceutical, Iran) based on Vitamin D replacement protocol and guidelines for optimizing the design of clinical studies of nutrient effects (19). Dietary recommendations for NAFLD (including a healthy diet and replacing unsaturated fat instead of saturated, reducing fried foods, red meat, sugars, and consuming whole grains) were done for all the subjects. The participants were asked not to change physical activity, lifestyle, and diet during the study. The sample size was estimated according to the serum level of 25(OH)D based on the study by Khan et al. (20). By considering confidence level of 95% and a power of 80%, the mean and standard deviation before and after intervention 51.25 ± 16.23 and 66.63 ± 24.99, respectively, and 30% change in this variable, the sample size was calculated 36 patients in each group. With the possibility of a 20% drop out, the required sample size per group was determined as 41 cases. Height was measured without shoes with a precision of 0.5 cm and weight was measured in light clothing to the nearest 0.1 kg; using the Seca scale (700-Vogel Hulk, Germany) calibrated electronic digital scale. Body mass index (BMI) was calculated as weight (kg) divided by squared height (m2). Waist circumference (WC) was measured on the broadest area between the edge of the lower ribs and the iliac crest with anthropometric tape and hip recorded as the maximum circumference to an accuracy of 0.5 cm. Total body fat (TF) and visceral fat (VF) percentage were calculated using bioelectrical impedance analysis (Omron BF511). Dietary intakes of energy, macronutrients, calcium, phosphors, and Vitamin D were assessed by 24-hour dietary recall interview (one weekend and two week days) pre- and post- study. The daily nutrient intake was calculated by modified the Nutritionist IV software. Physical activity level was assessed by using the short form of the International Physical Activity Questionnaire by an instructed interviewer in which nine different metabolic equivalent (MET) levels were ranged on a scale from sleep/rest (0.9 METs) to high-intensity physical activities (> 6 METs) (21). Fasting blood sample were obtained from each participant after 12 hours overnight fast at the study entry and at the end of research. The samples centrifuged immediately and promptly stored at -70°C until analysis. Serum glucose concentration and liver enzyme (ALT, AST, and ALP) were measured (kit, Parsazmun, Tehran, Iran) through auto-analyzer instrument (Hitachi 911- Boehringer Mannheim) and fluorometric method. Serum 25(OH)D and adiponectin was measured by enzyme-linked immunosorbent assay (ELISA) kit (Fortress; UK and Mediagnost; Germany, respectively). PTH and insulin were measured by electrochemiluminescence (ELECSYS 2010) and chemiluminescence method, respectively. Calcium and phosphor were measured through auto-analyzer (Cobas Integra400). IR was assessed by Homeostasis model assessment of insulin resistance (HOMA-IR) as calculated by the following formula: (insulin (mU/mL) × FSG (mg/dL))/405). Higher HOMA-IR scores indicate lower insulin sensitivity. Distribution of quantitative data related to normality was assessed by Kolmogorov-Smirnov test. Data with normal distribution are reported as mean ± standard deviation. Chi-square and Independent t-test were used to compare qualitative basic, demographic variable, and quantitative variable, respectively. Comparison of changes after the intervention between groups was done by Independent t-test and Paired t-test was used for within-group comparisons. Analysis of covariance (ANCOVA) test was used to control confounding variables and determine the differences between the two groups post-intervention, while adjusting for baseline measurements and covariates. All the statistical analysis was performed with SPSS Statistical Software for Windows, version 17.0 (SPSS Inc., Chicago, ILL., USA). P values < 0.05 were considered significant. Among the 82 participants that were enrolled in the study, seven patients (four in the intervention and three in the control group) were excluded (Figure 1). At the end, 75 patients completed the study and no side effects were reported. Baseline characteristics of the study groups are shown in Table 1. There were no significant differences between groups for demographic characteristics, NAFLD severity, and sunlight exposure at baseline (P > 0.05). Anthropometric, physical activity, and dietary intake variables have been described in Table 2. Baseline data did not differ significantly among the groups in these variables. After the intervention, there was no significant difference in energy and macronutrients intake as well as Vitamin D, calcium, and phosphorus between groups. We found a significant decrease in weight, WC, and BMI within both groups after intervention. However, TF and VF were significantly decreased within intervention and control group, respectively (P = 0.001, P = 0.02). After adjusting for baseline, there were significant differences in TF and VF between groups at the end of the study (P < 0.001, P = 0.01). Abbreviations: BMI, body mass index; CHO, carbohydrate intake; CI, confidence interval; MD, Mean differences; PA, physical activity; TF, total body fat; VF, visceral fat; WC, waist circumference; WHR, waist to hip ratio. As seen in Table 3, there was no significant difference in baseline serum 25(OH)D between groups. After intervention, serum 25(OH) D increased significantly in the Vitamin D group (P < 0.001). Adiponectin and calcium levels increase and liver enzymes, insulin, and HOMA-IR decrease in both groups. However, these changes were not significant in the Vitamin D group (P = 0.73, P = 0.07, P = 0.25). At the end of the study, significant differences were shown in serum 25(OH) D, ALT, AST, ALP, and FBS between groups after adjusting for baseline, TF and VF (P < 0.05). In the intervention group, the improvement in NAFLD severity (reducing in grade) was significantly greater than control (P = 0.01). Abbreviation: ALT, alanine aminotransferase; ALP, alkaline phosphatase; AST, aspartate aminotransferase; CI, confidence interval; FBS, fasting blood sugar; HOMA-IR, Homeostatic model assessment of insulin resistance; MD, mean differences; PTH, parathyroid hormone. aValues are expressed s Mean ± SD. On the basis of our research, this study was the first randomized controlled clinical trial that evaluated the effects of high dose intramuscular injection of cholecalciferol (600,000 IU) on the liver function status in NAFLD patients. The results of this study showed that Vitamin D3 injection significantly increased serum levels of 25(OH)D (P < 0.001) and also resulted in a relative improvement in fatty liver severity, however, it did not show a significant change in IR, serum adiponectin, and liver enzymes. In agreement with our results, Einarsdottir et al. found that intramuscular injection of Vitamin D3 (600,000 IU) in subjects undergoing biliopancreatic diversion surgery significantly increased serum 25(OH)D levels (P < 0.001) after 1.5 months (22). Significant rise in serum 25(OH)D was also observed after two weeks in a study by Ostad Rahimi et al. in which healthy women received Vitamin D injections (600,000 IU) (19). Similar results were observed in the study of Cipriani et al. A single injection of 600,000 IU Vitamin D3 in Vitamin D deficient subjects could significantly increase serum 25(OH)D (P < 0.001) in two months (23). Furthermore, in a clinical trial conducted by Heshmat et al. the injection of 300,000 IU of Vitamin D3 in diabetic patients could significantly increase serum Vitamin D levels after three months (P = 0.007) (24). Previous studies have shown that serum 25 (OH) D levels were inversely related to the prevalence of diabetes, IR, and obesity (8). IR plays a role in the pathogenesis of NAFLD through the promotion of lipolysis and increased free fatty acids inflow into the liver (25). Vitamin D may interfere in NAFLD pathogenesis by involving in IR. Nakano et al. found that lack of Vitamin D intake in rats led to NAFLD progression and also showed that phototherapy attenuated IR by increasing the active form of Vitamin D in the serum of rats and impact on lipid transfer proteins (26). In clinical trials conducted on patients with diabetes and/or gestational diabetes, the injection of 300,000 IU Vitamin D3 did not change serum levels of insulin and HOMA-IR after three months (24, 27). Belenchia et al. demonstrated that oral supplementation of Vitamin D 4000 IU/day in obese adolescents caused a significant reduction in HOMA-IR after six months (P = 0.009) (17). Baziar et al. investigated the effect of oral Vitamin D supplements (500,00 IU/week) on IR in diabetic and Vitamin D deficient patients. After eight weeks of intervention, there were decreases in serum glucose, insulin, and HOMA-IR (P < 0.05) (16). The controversy in the results of studies regarding the effect of Vitamin D on IR may be due to the difference in duration of Vitamin D supplementation and also measuring methods of IR (28). Furthermore, it has been shown that the duration of the intervention of more than four months is possibly needed for significant improvement in IR (29). Fat accumulation in hepatocytes causes inflammation, fibrillation, and hepatic injuries. The mechanism of cell damage is unknown, however, adipokines such as adiponectin are known to be involved in this process (30). Due to its anti-inflammatory function, adiponectin is a key adipokine that may be linked to NAFLD pathology. Studies have shown that two adiponectin receptors are expressed in the liver. A study on mice suggested that adiponectin may have a protective effect in liver injury in NAFLD (14). The role of Vitamin D in adipokines activity is under investigation. It has been shown that Vitamin D regulates adiponectin gene expression in adipose tissue (10). Animal studies demonstrated that high levels of adiponectin reduce necrosis and liver steatosis and improve IR (14, 31). A positive correlation was found between adiponectin and serum 25(OH)D in healthy young people (12). In a clinical study, the daily intake of yogurt, fortified with Vitamin D (1000 IU) for 12 weeks, improved the level of adiponectin (P < 0.001) and IR (P = 0.03) in diabetic patients (15). However, in other studies, Vitamin D supplementation did not result in a significant change in serum adiponectin (16, 27). Adiponectin reduces the activity of acetyl-co-carboxylase and fatty acid synthase in the liver, thus, preventing triglyceride accumulation in hepatocyte (14) as well as improves glucose uptake and inhibits gluconeogenesis in liver; therefore, by improving insulin sensitivity it can have a positive effect on NAFLD. Moreover, it reduces oxidative stress and production of pro-inflammatory cytokines; this is while inflammation plays a main role in progression of NAFLD (15, 32). Vitamin D may modulate the effect of pro-inflammatory cytokines on circulating adiponectin through its anti-inflammatory effects. In addition, it is probable that Vitamin D regulates adiponectin synthesis due to the presence of its receptor in pre-adipocytes (33). In the present study, a single mega intramuscular dose of Vitamin D (600,000 IU) increased serum adiponectin, however, this increases was not significant in the intervention group (P > 0.05), as well as between the two groups, which is probably due to the short duration of the intervention. A limited number of studies have examined the effects of Vitamin D supplementation on liver enzymes and severity of steatosis in NAFLD patients. The results of some cross-sectional studies have shown that there is a correlation between serum 25(OH)D and liver enzymes (5, 34). In a clinical study, the supplementation with Vitamin D did not significantly change serum alanine aminotransferase (ALT), aspartate aminotransferase (AST), and grade of fatty liver (28). Foroughi et al. found that treatment with Vitamin D (500,00 IU/week) for 10 weeks reduced liver enzymes, however, this reduction was not significant (1). The results of the study by Barchetta et al. showed that the daily oral supplementation of Vitamin D (2000 IU), in a diabetic patient with NAFLD after 24 weeks, did not significantly change the serum ALT, AST, adiponectin, and IR as well as severity of steatosis based on the grade (35). In our study, serum ALT, AST, and ALP decreased in the intervention group non-significantly (P > 0.05). However, the severity of fatty liver attenuated significantly in the intervention group (P = 0.01). To more accurately determine histological change in the severity of steatosis, more accurate methods should be used, such as biopsy. This study is the first randomized controlled clinical trial that evaluates the effect of high dose intramuscular injection of Vitamin D on the liver function in patients with NAFLD. In addition, the dietary intake of Vitamin D, physical activity, and sunlight exposure, which are considered as confounding factors, were examined. The study’s weaknesses were included in the short duration of intervention and the impossibility to use placebo for the control group. Based on the results of the present study, a single intramuscular injection of Vitamin D (600,000 IU) in women with NAFLD could significantly increase serum 25(OH)D after one month and no change in serum calcium, phosphorus, and PTH were observed. In addition, it resulted in a relative improvement in hepatic steatosis based on grade of fatty liver. Furthermore, changes in serum levels of liver enzymes, adiponectin, and IR were not significant. However, more clinical trials with larger sample size, longer follow up duration, and measuring other biochemical factors are needed to determine the effects of Vitamin D supplementation on NAFLD progression. We kindly acknowledge the Research Vice Chancellor of Tabriz University of Medical Sciences (No. 5.71.433) for financial support. This article is provided from a MSc thesis with registered number at Tabriz University of Medical Sciences. The authors also appreciate all the patients for their participants in this research. Authors' Contribution: Mehrangiz Ebrahimi-Mameghani: Study concept and design, critical revision of the manuscript for important intellectual content, administrative, technical, and material support and study supervision, Sonia Mansourian Hosseini: Acquisition of data, analysis and interpretation of data, drafting of the manuscript and statistical analysis, Soodabeh Aliashrafi: Analysis and interpretation of data and statistical analysis. Funding/Support: This study was supported by Research Vice Chancellor of Tabriz University of Medical Sciences. 1. Foroughi M, Maghsoudi Z, Ghiasvand R, Iraj B, Askari G. Effect of vitamin D supplementation on C-reactive protein in patients with nonalcoholic fatty liver. Int J Prev Med. 2014;5(8):969-75. [PubMed: 25489444]. [PubMed Central: PMC4258669]. 2. Holick MF, Binkley NC, Bischoff-Ferrari HA, Gordon CM, Hanley DA, Heaney RP, et al. Evaluation, treatment, and prevention of vitamin D deficiency: An endocrine society clinical practice guideline. J Clin Endocrinol Metab. 2011;96(7):1911-30. doi: 10.1210/jc.2011-0385. [PubMed: 21646368]. 3. Holick MF, Binkley NC, Bischoff-Ferrari HA, Gordon CM, Hanley DA, Heaney RP, et al. Guidelines for preventing and treating vitamin D deficiency and insufficiency revisited. J Clin Endocrinol Metab. 2012;97(4):1153-8. doi: 10.1210/jc.2011-2601. [PubMed: 22442274]. 4. Pike JW, Meyer MB. Fundamentals of vitamin D hormone-regulated gene expression. J Steroid Biochem Mol Biol. 2014;144 Pt A:5-11. doi: 10.1016/j.jsbmb.2013.11.004. [PubMed: 24239506]. [PubMed Central: PMC4144817]. 5. Rhee EJ, Kim MK, Park SE, Park CY, Baek KH, Lee WY, et al. High serum vitamin D levels reduce the risk for nonalcoholic fatty liver disease in healthy men independent of metabolic syndrome. Endocr J. 2013;60(6):743-52. doi: 10.1507/endocrj.EJ12-0387. [PubMed: 23411507]. 6. Musso G. Non-alcoholic fatty liver, adipose tissue, and the bone: A new triumvirate on the block. Endocrine. 2012;42(2):237-9. doi: 10.1007/s12020-012-9748-2. [PubMed: 22801991]. 7. Barchetta I, Angelico F, Del Ben M, Baroni MG, Pozzilli P, Morini S, et al. Strong association between non alcoholic fatty liver disease (NAFLD) and low 25(OH) vitamin D levels in an adult population with normal serum liver enzymes. BMC Med. 2011;9:85. doi: 10.1186/1741-7015-9-85. [PubMed: 21749681]. [PubMed Central: PMC3148980]. 8. Wang X, Li W, Zhang Y, Yang Y, Qin G. Association between vitamin D and non-alcoholic fatty liver disease/non-alcoholic steatohepatitis: results from a meta-analysis. Int J Clin Exp Med. 2015;8(10):17221-34. [PubMed: 26770315]. [PubMed Central: PMC4694215]. 9. Hashemi Kani A, Alavian SM, Esmaillzadeh A, Adibi P, Azadbakht L. Dietary quality indices and biochemical parameters among patients with non alcoholic fatty liver disease (NAFLD). Hepat Mon. 2013;13(7). e10943. doi: 10.5812/hepatmon.10943. [PubMed: 24065998]. [PubMed Central: PMC3776150]. 10. Kocot J, Dziemidok P, Kielczykowska M, Kurzepa J, Szczesniak G, Musik I. Is there any relationship between plasma 25-Hydroxyvitamin D(3), adipokine profiles and excessive body weight in type 2 diabetic patients? Int J Environ Res Public Health. 2017;15(1). doi: 10.3390/ijerph15010019. [PubMed: 29295491]. [PubMed Central: PMC5800119]. 11. Adolph TE, Grander C, Grabherr F, Tilg H. Adipokines and non-alcoholic fatty liver disease: Multiple interactions. Int J Mol Sci. 2017;18(8). doi: 10.3390/ijms18081649. [PubMed: 28758929]. [PubMed Central: PMC5578039]. 12. Gannage-Yared MH, Chedid R, Khalife S, Azzi E, Zoghbi F, Halaby G. Vitamin D in relation to metabolic risk factors, insulin sensitivity and adiponectin in a young Middle-Eastern population. Eur J Endocrinol. 2009;160(6):965-71. doi: 10.1530/EJE-08-0952. [PubMed: 19289535]. 13. Dastani Z, Hivert MF, Timpson N, Perry JR, Yuan X, Scott RA, et al. Novel loci for adiponectin levels and their influence on type 2 diabetes and metabolic traits: A multi-ethnic meta-analysis of 45,891 individuals. PLoS Genet. 2012;8(3). e1002607. doi: 10.1371/journal.pgen.1002607. [PubMed: 22479202]. [PubMed Central: PMC3315470]. 14. Xu A, Wang Y, Keshaw H, Xu LY, Lam KS, Cooper GJ. The fat-derived hormone adiponectin alleviates alcoholic and nonalcoholic fatty liver diseases in mice. J Clin Invest. 2003;112(1):91-100. doi: 10.1172/JCI17797. [PubMed: 12840063]. [PubMed Central: PMC162288]. 15. Neyestani TR, Nikooyeh B, Alavi-Majd H, Shariatzadeh N, Kalayi A, Tayebinejad N, et al. Improvement of vitamin D status via daily intake of fortified yogurt drink either with or without extra calcium ameliorates systemic inflammatory biomarkers, including adipokines, in the subjects with type 2 diabetes. J Clin Endocrinol Metab. 2012;97(6):2005-11. doi: 10.1210/jc.2011-3465. [PubMed: 22442277]. 16. Baziar N, Jafarian K, Shadman Z, Qorbani M, Khoshniat Nikoo M, Abd Mishani M. Effect of therapeutic dose of vitamin d on serum adiponectin and glycemia in vitamin d-insufficient or deficient type 2 diabetic patients. Iran Red Crescent Med J. 2014;16(9). e21458. doi: 10.5812/ircmj.21458. [PubMed: 25593737]. [PubMed Central: PMC4270651]. 17. Belenchia AM, Tosh AK, Hillman LS, Peterson CA. Correcting vitamin D insufficiency improves insulin sensitivity in obese adolescents: A randomized controlled trial. Am J Clin Nutr. 2013;97(4):774-81. doi: 10.3945/ajcn.112.050013. [PubMed: 23407306]. 18. Del Ben M, Polimeni L, Baratta F, Pastori D, Loffredo L, Angelico F. Modern approach to the clinical management of non-alcoholic fatty liver disease. World J Gastroenterol. 2014;20(26):8341-50. doi: 10.3748/wjg.v20.i26.8341. [PubMed: 25024593]. [PubMed Central: PMC4093688]. 19. Ostad Rahimi AR, Mahbob SA, Abbas Alizadeh Farhanghi M, Vahed Jabarii M. [The effect of cholecalciferol injection on serum 25 hydroxy vitamin D and parathyroid hormone in obese and none obese reproductive age women]. Pharm Sci. 2009;15(1):9-16. Persian. 20. Khan AH, Rohra DK, Saghir SA, Udani SK, Wood R, Jabbar A. Response of a single 'mega intramuscular dose' of vitamin D on serum 25OHD and parathyroid hormone levels. J Coll Physicians Surg Pak. 2012;22(4):207-12. [PubMed: 22482374]. 21. Aadahl M, Jorgensen T. Validation of a new self-report instrument for measuring physical activity. Med Sci Sports Exerc. 2003;35(7):1196-202. doi: 10.1249/01.MSS.0000074446.02192.14. [PubMed: 12840642]. 22. Einarsdottir K, Preen DB, Clay TD, Kiely L, Holman CD, Cohen LD. Effect of a single 'megadose' intramuscular vitamin D (600,000 IU) injection on vitamin D concentrations and bone mineral density following biliopancreatic diversion surgery. Obes Surg. 2010;20(6):732-7. doi: 10.1007/s11695-009-0024-3. [PubMed: 19949888]. 23. Cipriani C, Romagnoli E, Pepe J, Russo S, Carlucci L, Piemonte S, et al. Long-term bioavailability after a single oral or intramuscular administration of 600,000 IU of ergocalciferol or cholecalciferol: Implications for treatment and prophylaxis. J Clin Endocrinol Metab. 2013;98(7):2709-15. doi: 10.1210/jc.2013-1586. [PubMed: 23766519]. 24. Heshmat R, Tabatabaei-Malazy O, Abbaszadeh-Ahranjani S, Shahbazi S, Khooshehchin G, Bandarian F, et al. Effect of vitamin D on insulin resistance and anthropometric parameters in type 2 diabetes; a randomized double-blind clinical trial. Daru. 2012;20(1):10. doi: 10.1186/2008-2231-20-10. [PubMed: 23351271]. [PubMed Central: PMC3555787]. 25. Manco M. Insulin resistance and NAFLD: A dangerous liaison beyond the Genetics. Children (Basel). 2017;4(8). doi: 10.3390/children4080074. [PubMed: 28805745]. [PubMed Central: PMC5575596]. 26. Nakano T, Cheng YF, Lai CY, Hsu LW, Chang YC, Deng JY, et al. Impact of artificial sunlight therapy on the progress of non-alcoholic fatty liver disease in rats. J Hepatol. 2011;55(2):415-25. doi: 10.1016/j.jhep.2010.11.028. [PubMed: 21184788]. 27. Mozaffari-Khosravi H, Hosseinzadeh-Shamsi-Anar M, Salami MA, Hadinedoushan H, Mozayan MR. Effects of a single post-partum injection of a high dose of vitamin D on glucose tolerance and insulin resistance in mothers with first-time gestational diabetes mellitus. Diabet Med. 2012;29(1):36-42. doi: 10.1111/j.1464-5491.2011.03473.x. [PubMed: 21977923]. 28. Sharifi N, Amani R, Hajiani E, Cheraghian B. Does vitamin D improve liver enzymes, oxidative stress, and inflammatory biomarkers in adults with non-alcoholic fatty liver disease? A randomized clinical trial. Endocrine. 2014;47(1):70-80. doi: 10.1007/s12020-014-0336-5. [PubMed: 24968737]. 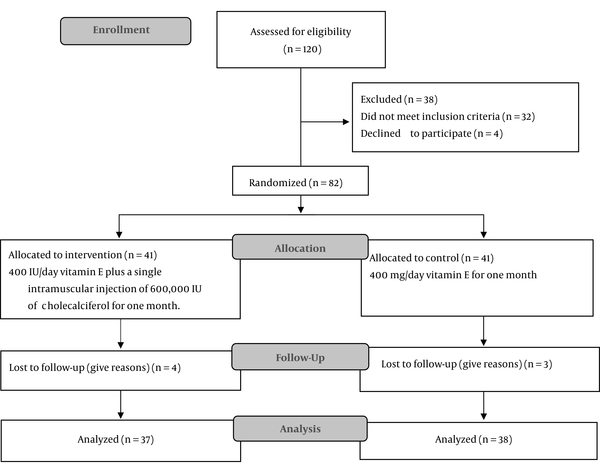 29. von Hurst PR, Stonehouse W, Coad J. Vitamin D supplementation reduces insulin resistance in South Asian women living in New Zealand who are insulin resistant and vitamin D deficient - a randomised, placebo-controlled trial. Br J Nutr. 2010;103(4):549-55. doi: 10.1017/S0007114509992017. [PubMed: 19781131]. 30. Adams LA, Lindor KD. Nonalcoholic fatty liver disease. Ann Epidemiol. 2007;17(11):863-9. doi: 10.1016/j.annepidem.2007.05.013. [PubMed: 17728149]. 31. Kim JY, van de Wall E, Laplante M, Azzara A, Trujillo ME, Hofmann SM, et al. Obesity-associated improvements in metabolic profile through expansion of adipose tissue. J Clin Invest. 2007;117(9):2621-37. doi: 10.1172/JCI31021. [PubMed: 17717599]. [PubMed Central: PMC1950456]. 32. Balmer ML, Joneli J, Schoepfer A, Stickel F, Thormann W, Dufour JF. Significance of serum adiponectin levels in patients with chronic liver disease. Clin Sci (Lond). 2010;119(10):431-6. doi: 10.1042/CS20100008. [PubMed: 20524936]. [PubMed Central: PMC2916712]. 33. Lee S, Lee DK, Choi E, Lee JW. Identification of a functional vitamin D response element in the murine Insig-2 promoter and its potential role in the differentiation of 3T3-L1 preadipocytes. Mol Endocrinol. 2005;19(2):399-408. doi: 10.1210/me.2004-0324. [PubMed: 15528275]. 34. Skaaby T, Husemoen LL, Borglykke A, Jorgensen T, Thuesen BH, Pisinger C, et al. Vitamin D status, liver enzymes, and incident liver disease and mortality: A general population study. Endocrine. 2014;47(1):213-20. doi: 10.1007/s12020-013-0107-8. [PubMed: 24272594]. 35. Barchetta I, Del Ben M, Angelico F, Di Martino M, Fraioli A, La Torre G, et al. No effects of oral vitamin D supplementation on non-alcoholic fatty liver disease in patients with type 2 diabetes: A randomized, double-blind, placebo-controlled trial. BMC Med. 2016;14:92. doi: 10.1186/s12916-016-0638-y. [PubMed: 27353492]. [PubMed Central: PMC4926287].